On a rainy July day in 2014, Grand Staircase-Escalante National Monument paleontologist Alan Titus made an unexpected find on the Kaiparowits Plateau. He’d been over this area — a flat gray expanse interrupted by scraggly piñon and juniper — at least five times before. But the recent heavy rains had exposed new bone: part of a tyrannosaur skull. “I just got goose bumps,” Titus said. As he and his team started digging at the site, which they nicknamed “Rainbows and Unicorns,” they discovered the fossilized remains of an entire tyrannosaur family. Beneath the dry, drab earth of the Kaiparowits lies a wealth of fossils, a continuous record of more than 25 million years that paleontologists have only just begun to explore. But this landscape also holds coal, a huge untapped deposit. The door to mining closed when the monument was established two decades ago, outraging locals and Utah legislators, who hoped that coal would fuel the local economy. Now, President Donald Trump’s executive order to downsize the monument has revived the possibility of mining the Kaiparowits, unearthing a conflict both decades and millions of years in the making. Jeanette Bonnell, left, Tylor Birthisel, center, and Alan Titus, second from right, work to reposition a plaster-encased piece of a tyrannosaur fossil. 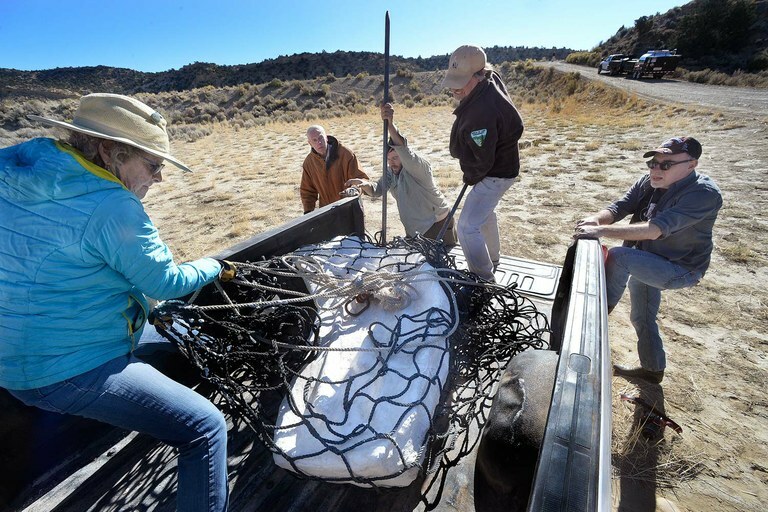 The nearly complete fossilized remains of a tyrannosaur found in southern Utah's Grand Staircase-Escalante National Monument were airlifted to the Natural History Museum of Utah on October 15, 2017. Lush swamplands lay just inland of the seaway’s shoreline. Over millennia, the seas flowed in and out, trapping layers of accumulated plant matter — the remnants of those swamplands, eventually pressurized into coal — between other layers rich with dinosaur fossils. The two resources are inherently mixed up together, both geologically and politically. The once-proposed Smoky Hollow Mine holds 62 billon tons of coal, though estimates of the recoverable amount vary widely and are all much lower than that: maybe 11 billion tons, maybe 5 billion. The nearby town of Kanab had long anticipated the development of the mine by Andalex Resources, a Dutch company, and the jobs and tax dollars it would provide. And when President Donald Trump called for a review of monuments of a certain size designated starting in 1996, the timeframe was clearly calculated to include this monument that many in Utah still fervently oppose. It’s also no coincidence that White House staff secretary Rob Porter — one of the two individuals who personally vet all documents that reach Trump’s desk — previously served as Hatch’s chief of staff. Interior Secretary Ryan Zinke’s monuments memorandum, which leaked to the press in September, notes that an estimated “several billion tons” of coal lie within Grand Staircase-Escalante, and recommends redrawing the monument’s boundaries. Zinke visited the still-smoldering coal seam during his Utah monuments “listening tour” last May. Though details have yet to be made public, Trump reportedly told Hatch, in a phone call on Oct. 27, that he intends to shrink Bears Ears and Grand Staircase-Escalante national monuments — and open up the Kaiparowits Plateau to coal mining. But there’s a difference between long-running coal mines that communities have relied on for decades and an untapped deposit that currently lacks road or rail links — especially one that shares space with a well-preserved fossil record spanning tens of millions of years. “Implicit in the withdrawal for this monument,” said then-Interior Secretary Bruce Babbitt at a 1997 hearing about Grand Staircase-Escalante, “is a decision that mining is incompatible with the other values that the proclamation seeks to protect.” And the communities surrounding the monument have since fared reasonably well. According to Headwaters Economics, Kane and Garfield counties have experienced strong growth since the designation: From 2001 to 2015, the counties saw a 24 percent increase in jobs, and personal income rose by 32 percent. With the local economies intact and the market for coal diminishing, to cut a swath of the Kaiparowits out of the monument now would be a political and symbolic move, not a practical one. Though Trump has swiftly done away with Obama-era measures that inhibited the growth of coal production, including lifting a temporary ban on new coal leases, his administration cannot stop coal’s decline. As competing natural gas gluts the market, more and more coal power plants are announcing plans to shut down, including Utah’s largest coal-fired plant, the Intermountain Power Project. Any new mining endeavor would face a steep uphill fight. 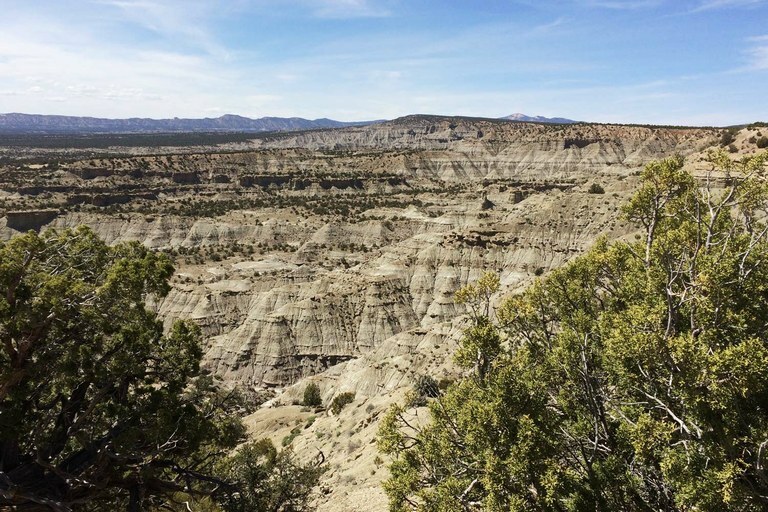 The Kaiparowits Plateau in Grand Staircase-Escalante National Monument, which has been the site for many fossil discoveries, also holds a large untapped deposit of coal. Every place I’ve been in Grand Staircase-Escalante has evoked in me a deep, almost embarrassing sense of wonder. I felt it when I wandered alone across colossal, wind-whipped sandstone buttes and when I sank knee-deep in mud in a Paria River box canyon. I felt it when I accompanied an archaeologist several miles into Hackberry Canyon, creek pebbles filling my shoes, to reach a hundred-year-old cabin surrounded by cottonwoods and red rock. And I felt it on the Kaiparowits with Titus as he recounted the geological story written into the spare landscape, while I tried to grasp the sprawling prehistory the rocks exposed. At one point, he showed me where oyster beds deposited at sea level had been lifted up thousands of feet. A hundred million years ago, this stretch of rocky desert would’ve looked and felt like southern Louisiana today, Titus said. We cracked open chunks of gray rock, exposing oysters and ammonites, clams and snails. Deep time is hard to get your head around if you can’t hold its evidence in your hands. Touching fossilized oysters, holding bits of dinosaur bone — if it sticks when you lick it, Titus told me, it’s bone — made far-off former worlds real to me. Finding three tyrannosaurs buried together means “something unusual happened here,” Titus told me at the “Rainbows and Unicorns” site. When his team started finding charcoal, they thought: forest fire. Eventually a hypothesis took shape: Fleeing a fire, the dinosaurs retreated into a lake, where the fire’s heat killed them. The bones were buried, unearthed by a river flood, and then buried again. Fossils show that fish, turtles, raptors and hadrosaurs perished, too. An entire narrative reconstructed from the fossil record — all this, unearthed from one small piece of the plateau’s rugged expanse. Note: A version of this story appeared in our print edition with new information following President Donald Trump’s decision to shrink Grand Staircase-Escalante National Monument. This story has been updated.